Jitterbug! begins in 1931 when Billy Rhythm, a dancer and the quintessential American, returns to Harlem having failed to make it on the T.O.B.A (Theater Owners Booking Association) circuit, the black man’s vaudeville. That year was chosen because it marks a pivotal event that led to one of those very rare moments in history which we look back on as magical: Cab Calloway replaced Duke Ellington at the Cotton Club. Who knew then that a young, unknown band leader (Cab was 22-years-old) and his equally young and unknown band (The Missourians) would set the world on fire when they teamed up with two young Jewish songwriters working for the mob in a small nightclub in Harlem? Prohibition, then 10-years running, brought people of all colors and faiths together to make music and money, and to drink away the Great Depression-- the second great event that propels this story along: it brought Billy back to Harlem broke and looking for a job. 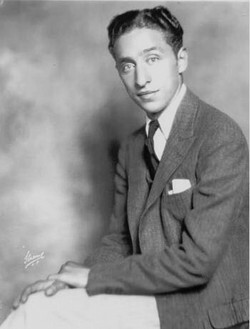 As the play unfolds, after many rejections and a few beatings, Billy finally lands a gig at the Cotton Club where Cab is settling in with the club’s two young Jewish songwriters, Harold Arlen and Ted Koehler. Harold Arlen (who eight years later would write the music for The Wizard of Oz) is racing to rehearse the club’s next show Rhyth-mania only days away from opening. Although the songwriters and the mobsters are very minor characters in this story, their influence permeates everything since the songwriters are providing the music for a dance contest which sets into motion a confrontation between the club’s entries (Billy and his sweetheart Tharbis Jefferson) and contestants from Billy’s ex-gang the Jolly Fellows who will stop at nothing to win-- including murder. Re Arlen, the late great Ethel Waters described him as "the Negroest white man I know;" a high compliment considering he's the son of a Jewish cantor. The music especially reminds us that even when Jim Crow laws and racism were institutionalized and the Great Depression and Prohibition were grinding down the American spirit, art and beauty could still find a way of taking root thanks, in part, to the black and white lawbreakers, musicmakers and poets who, when they came together out of sheer circumstance, desperation and greed, unknowingly were contributing to the Great American Song Book and making Harlem America's most mythic city. This underlying theme of the irrepressible American spirit-- embodied specifically in Billy Rhythm-- can be heard in nearly every song-- and seen in every dance move. The 1936 hit You Can’t Live In Harlem, written by a couple of “nice Jewish boys” not associated with the Cotton Club-- but performed by African Americans-- is a great and rousing example of this symbiotic relationship born in one of America’s darkest moments. It is a fittingly appropriate beginning because it offers up the opportunity to provide musical bookends to the story. If the play begins in collaboration with a song about Harlem, it also ends in collaboration, coming full-circle 33-years later, this time with Duke Ellington composing Harlem, an experimental symphonic piece he recorded with his band and some of Europe’s best symphony orchestras. It shows the evolution of the big band sound and serves as a great tone poem for the play’s magical finale. Jitterbug! music in order of appearance in the dancical. Click on highlighted titles to hear the music. 1. 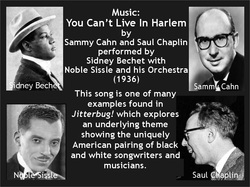 Opening: ﻿You Can’t Live In Harlem﻿ by Sammy Cahn and Saul Chaplin, performed by Sidney Bichet with Noble Sissle and his Orchestra (1936). 2. ﻿Get Happy﻿ by Harold Arlen and Ted Koehler (1930). First song (and national hit) they wrote together before working for the mob as songwriters at the Cotton Club, producing two shows a year from 1930-1934. The late great Ethel Waters described Arlen as the “Negroest white man I know.” Not bad for a cantor's son. 3. ﻿That Rhythm Man﻿ by Andy Razaf (Andreamentena Razafinkeriefo), Fats Waller and Harry Brooks, performed by Chick Webb and his Orchestra (1929). Re Andy Razaf, he was the son of Henri Razafinkarefo, nephew of Queen Ranavalona III and Jennie (Waller) Razafinkarefo, the daughter of John L. Waller, the first African-American consul to Imerina. His father was killed in the French invasion of Madagascar and forced his pregnant 15-year-old mother to escape to the U.S. where Andy was born in 1895. ]He was raised in Harlem and at the age of 16 he quit school and took a job as an elevator operator at a Tin Pan Alley office building. A year later he penned his first song text, embarking on his career as a lyricist. During this time he would spend many nights in the Greyhound bus station in Times Square and would pick up his mail at the Gaiety Theatre office building which was considered the black Tin Pan Alley. Some of his hits include Ain't Misbehavin' (1929) which he co-wrote with Fats and Harry and was later sung by Lena Horne in the 1943 film Stormy Weather; Honeysuckle Rose (1929), Stompin' at the Savoy (1934), and as an arranger for Glenn Miller's signature hit, In the Mood (1939). 4. ﻿Harlem Congo﻿ by Harry A. White (who coined the word “jitterbug”) and performed by Chick Webb and his Orchestra (1937). 5.﻿ Peace In The Valley﻿ by Thomas A. Dorsey (1939). Considered the “father of black gospel music,” this song has been recorded by just about everybody including Sam Cooke and Elvis. 6. The Artist in America by Ornette Coleman (1972). The inventor of "Free Jazz," this music is used to emphasize the dancical's most violent moments. 9. Jitis Blues by Memphis Minnie (1930). Born Lizzie Douglas in 1897, she ran away from home at age 13 to live and entertain on Beale Street in Memphis, TN. To survive in the male dominated blues scene, she made money by playing guitar, singing, and prostitution. Used as music for the slow drag dance number, this is a song about "meningitis killing me." 10. St. James Infirmary is an Irish folk song dating back to 1790 copyrighted by songwriter Irving Mills, recorded by Cab Calloway (1929). Mills founded EMI records and was the manager of many artists at that time including Louis Armstrong, Duke Ellington, Cab Calloway, and Ella Fitzgerald. 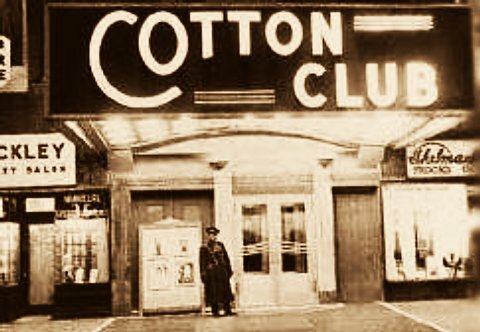 Mills put Ellington and Calloway in the Cotton Club and was one of the first to record black and white musicians together. 11. Let's Face the Music and Dance by Irving Berlin, recorded by Chick Webb with 19-year-old Ella Fitzgerald singing (1936). This hit song first appeared in the Fred Astaire and Ginger Rogers movie Follow the Fleet. It has been recorded by just about everybody including Frank Sinatra, Willy Nelson and some guy named Taco. 12. ﻿﻿Stompin’ At The Savoy﻿﻿ ﻿by ﻿﻿Edgar Sampson﻿ ﻿and Andy Razaf. Recorded by Chick Webb where it went to #10 in the charts (1934). Ozzie Nelson and his Orchestra recorded it in 1936 (#11). 13.﻿﻿﻿﻿﻿ ﻿﻿﻿﻿Let’s Get Together﻿﻿﻿﻿﻿﻿ ﻿﻿﻿by Chick Webb (1934). Considered his “theme song.” Arranged by Edgar Sampson. 14. The Man From Harlem by Cab Calloway (1932). This man’s the “reefer man." 16. Finale: Harlem, one of Duke Ellington’s few symphonic compositions (1963). The piece was recorded with “500 of Europe’s finest musicians” associated with the Paris Symphony Orchestra, the Stockholm Symphony Orchestra, the Hamburg Symphony Orchestra, and the La Scalla Symphony Orchestra.